Home DVR Examiner Updates Updates More Often with DVR Examiner 2.2 – Available Now! 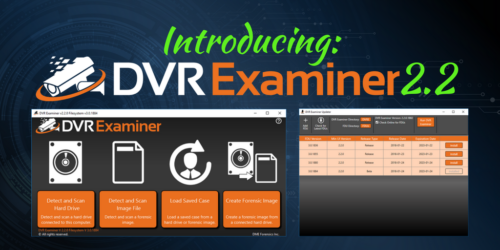 It’s the feature you have been hearing about for months, DVR Examiner 2.2 has arrived, bringing continuous filesystem updates straight to your computer. We are very excited to release this version of DVR Examiner to our users, as it enables us to continue bringing you more DVR filesystems, faster than ever. But that’s not the only change we’ve made to this version. We are introducing a new DVR Examiner logo and a new “Updater” application to help you manage your filesystem library. Read on to learn more about how we are working to make DVR data recovery easier and faster with the new features and performance improvements in DVR Examiner 2.2. Filesystem Database Updates (FDUs)- These packages will allow users to continuously update DVR Examiner as we add support for additional DVRs and resolve issues with existing filesystems. DVR Examiner Updater- This small utility is included with the DVR Examiner 2.2 download, and allows the user to manage their FDU library. Redesigned save/load functionality- Saved cases from versions prior to DVR Examiner 2.2 are not compatible with this update. Going forward, we will attempt to maintain compatibility as much as possible and users will be notified if there are changes that may impact compatibiltiy. Continued improvements and bug fixes to increase performance and stability. We also resolved issues with the profiler and added debugging tools to provide more technical support to our users. Going forward, new filesystem updates and improvements will come in the form of updated Filesystem Database Updates. We are hoping to have our first FDU available in the next 2-3 weeks! Keep in mind, in order to use DVR Examiner 2.2, you must have an active subscription! Expired users will still be able to load saved cases as long as they were saved in 2.2 while their subscription was active. To re-activate your DVR Examiner subscription, contact your Account Manager, or email sales@dmeforensics.com.